I spent about 16 miles in them total today, 3 miles in my combined cycling/train commute to work, and 13 miles on my commute home. I don't really like complete foot retention as I like being able to take off quickly from a stop in busy intersections, I value being able to ride in any shoe, and I get nervous about falling over on poor surfaces such as wet, muddy leaves or rain-slick brick, etc. My previous solution to these desires was to use a BMX pedal with some pretty aggressive spikes. These were good in the wet, but they tore up my shin pretty bad a couple of times and I found that I wanted my foot to be a little more secure in place. The pedal spindles started to develop some play on my VP-001 pedals, so I figured I'd try something completely different. The pedals are modeled off the classic Lyotard Marcel Berthet M23 pedals which are claimed to have been some of the most popular pedals in the mid-20th century. Style-wise, I think they fit my bike much better than my old pedals did. They are cast aluminum with a chromed steel toe clip, so the toe clip should be quite durable. I already scraped the bottom of the clip against an aggressive speed bump with no visible damage to the clip. Performance wise, I like them. They definitely don't grip as well in the wet, but with the half clip keeping the toe of my shoe pretty well planted, this didn't make a huge difference, as I found my feet to be maintaining a stable position regardless of how hard I was pedaling. The large tongue on the back of the pedal is very intuitive to use, and I found myself getting my foot into position very quickly from a stop. I did fumble a little twice, but I figure with a few more rides they're going to be second nature. The pedals can take full toe clips and straps as well, and I might try those in the future, but these half clips seem good for now. The pedals also have ridges for slots on old-style cycling shoes, but the platform is wide enough and substantial enough that I had zero discomfort riding in my Converse. Overall I think they are great pedals for anyone who wants to be able to ride in any shoe or has to stop and start very frequently in busy intersections. I really dig those pedals, they're on the short list of pedals to use. If you're not used to clips and straps, you'll get it with the half clips. I never tighten my straps, I could probably do well with half clips. I used clips and straps for a long time before I fell twice in one day on slippery surfaces and switched to BMX flat pedals. I think that these pedals with half clips are a really great solution for my needs. These are the next pedals I am going to get. Now I am using MKS GR-9 with MKS half toe clips and they seem to work fine with 11 size shoes. Maybe I'll give these a try. I use FA bmx pedals on my commuter because when I'm on it I'm in Doc Marten's 90% of the time (bouncing soles yee haw!) and they're definitely not clip/strap friendly. The FAs also have a very large surface, which I was drawn to based on the shoes. Since I'm down here in southern AZ the one apparent drawback to these -- no spikes for wet grip -- is mostly a nonissue, so I'm gonna take a closer look. Thanks for the tip! Yeah, I just switched from pedals with spikes, but I didn't miss the extra grip from spikes. The surface of this pedal was *very* slick in the wet, but the half clip kept my foot planted regardless. I really enjoyed it! I have them on most of my bikes. They also get switched to the other bikes for long rides. Great pedals. Got a pair of these on the way... last piece of my 11.8 commuter-beater puzzle. Thanks again for the heads-up! I love the urban platforms with half clips! I use them on my New Albion and I want a set for my Serotta. My feet are of the wide variety with high arches and Campa-style pedals kill me after 10-20 miles. Pedals with toe-clips and cleats were designed so that the toe-clip NEVER touched the toe of the shoe. A metal toe-clip rubbing against the toe of a shoe can cause wear ofthe shoe. I suggest wrapping a bit of tape or leather on your metal hahl-clips so that they don't scuff the toes of your shoes. I still really like the pedals, but I swapped out the half-clip for some MKS LL clips with straps. 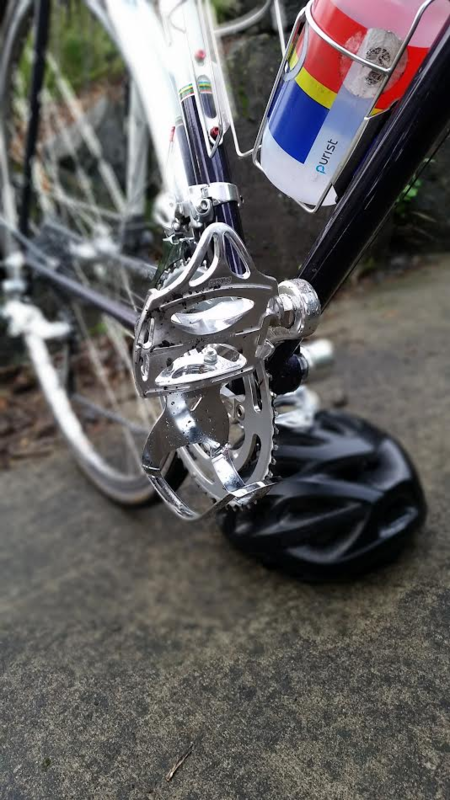 I really miss the ease of getting into the pedal with the half clip, but it was just too short; the ball of my foot was a full cm behind the pedal spindle. I installed these, but wasn't able to enjoy them until I took a file to the two teeth on the crank side of the platform. They would sit under the edge of my foot and drive me crazy. With those little guys gone, yeah, I think I'm digging the Urban Platforms. I'm wondering if these would work without toe clips or half clips but with some grip tape on the surface? Any ideas? I'm in Portland, so need something that will grip in the wet. My current pedals (mks touring) are more slippery than I'd like. The fancy little easy-flip extension to the rear of the pedal would mean they fall backward instead of forward any time you're off the pedal. If you can adjust to this, there's plenty of flat space on the pedal to accommodate grip tape. I have full size clips on mine. But I leave the straps loose enough where it's close to what you're trying for. Great pedals for any kind of shoe. I wonder if they are a Grant Peterson favorite? I have a pair of these. As it turns out, not my favorite pedal. Puts all too much pressure directly on the ball of the foot, generating a hotspot and some discomfort on long rides. 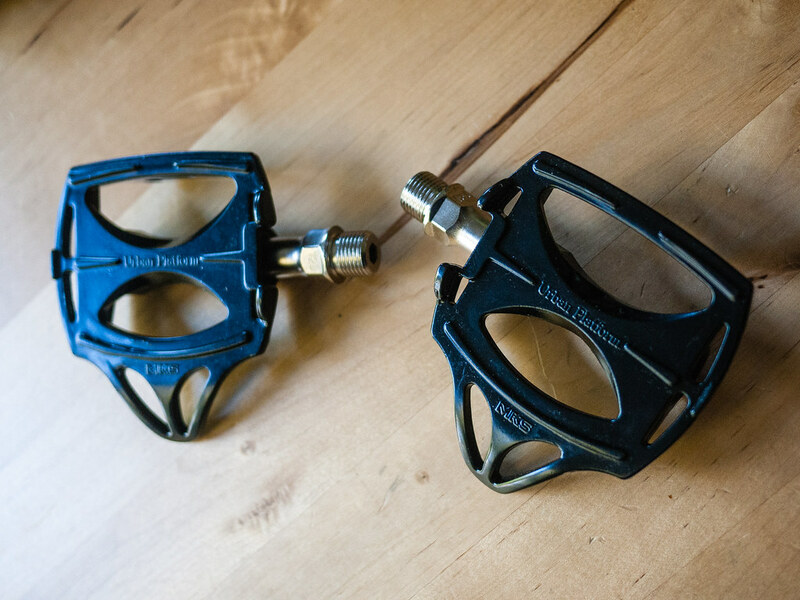 Much prefer classic MKS Sylvan *Prime* pedals, in either the road or, better yet, wide touring cage. I've been using MKS GR-9's, sorta similar to what you're using, with MKS half-clips on my Raleigh. They don't have a very grippy surface, so you pretty much have to use some sort of clip. 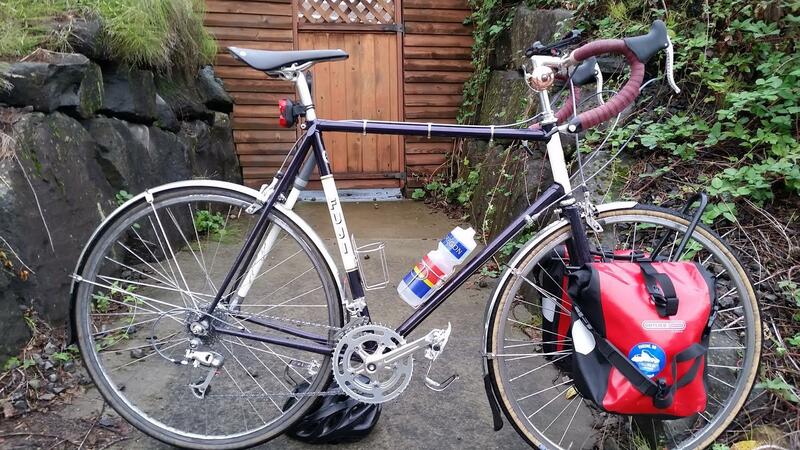 I almost went with the MKS platforms for the Miyata, but then I came across the SP-11s. I decided it was kinda cool to stick with SR pedals (replacing the SP-155s that came stock), and the SOMA clips were an added bonus/incentive. I love MKS pedals. Excellent price, lots of choices, well built, & serviceable. I have them on 5 road bikes. Even have a few of their toe clips down to the dust cap tool. My fav are the touring pedals. If they had a Campy logo on it ppl would pay 4x more. Last edited by LiquorLad; 03-08-17 at 08:22 PM. Where to find modern(ish) replacement rims?